With the key concepts taught in Intercessors Arise, you’ll learn to release your potential in prayer through practical and personal applications steps. Use it alone or with a group, and stand in the gap for a world in need of change. Prayer happens for many reasons, but no prayer is uttered by accident. When we pray, individual lives change. Imagine watching whole neighborhoods affected, cities and nations touched by the power of prayer. “Intercessors Arise by Debbie Przybylski is a powerful book on the application of prayer not just on those around us but cities and nations. 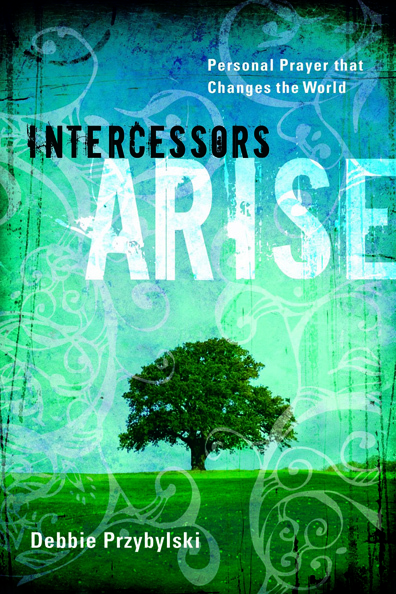 The dictionary defines an intercessor as “one who intercedes by prayer, petition in favor of another”. After readying and applying the personal applications in this book to your life you will be an intercessor to many others and as mentioned before even nations. The power of prayer is real and with this book you will learn to use that power. “This is a wonderful book to help inspire and encourage your prayer life! Debbie gives lots of examples of people and how prayer helped them. She also has Bible verses and examples of prayers that you can say. She ends each chapter with a personal application, where she gives you Bible passages to read, questions, challenges, and just ways to put the chapter into practice…I think this book is set up to be a chapter a week Bible study, and there’s even exercises that require multiple people, like a church class. This would still be great for an individual study. For me, I like it as a chapter every 2 to 3 days. That gives time to answer the questions honestly and really soak in the information. For review purposes, I read it a bit quicker than that this time.